Office of the Librarian of Congress, at Washington, D. C.
The legislative powers of the General Government are vested in the United States Congress, which consists of two Houses—Senate and House of Representatives. The Senate consists of 72 members, two from each State. President—The Vice President of the United States, ex officio. Salary of Senators, $3,000 and mileage, 20 cents per mile. The House of Representatives consists of 241 members. Chief Justice—Salmon P. Chase, of Ohio, salary $6,500. Associates—Samuel Nelson, Cooperstown, N.Y.; William Strong, Philadelphia, Penn. ; Nathan Clifford, Portland, Me. ; Noah M. Swayne, Columbus,O. ; David Davis, Bloomington, Ill.; Samuel F. Miller, Keokuk, Iowa; Stephen J.Field, California; Joseph P. Bradley, of New Jersey. Salary of each,$6,000. The Court holds one term annually, at Washington,commencing on the first Monday in December. Governor’s Staff—Adjutant General, Franklin Townsend; Inspector General, James McQuade; Commissary General of Ordnance, Samuel W. Johnson; Engineer in Chief, William M. Tweed, Jr.,; Advocate General, James B. Craig; Surgeon General, Jacob S. Mosher; Quartermaster General, Robert Lennox Banks; Paymaster General, George J.Magee; Commissary General of Subsistence, Albert Steinway. Aids-de-camp—Walter P. Warren, William F. Moller, Lester B. Faulkner, Herman Uhl, Frank N. Lord. Office of Secretary of State—Secretary of State, G. Hilton Scribner; Deputy Secretary of State, Anson S. Wood. Comptroller’s Office—Comptroller, Nelson K. Hopkins; Deputy Comptroller, Philip Phelps. Treasurer’s Office—Treasurer, Thomas Raines; Deputy Treasurer, Dewitt E. Ellis. Attorney-General’s Office—Attorney-General, Francis C. Barlow; Deputy Attorney-General, Marcus T. Hun. State Engineer’s Office—State Engineer and Surveyor, William B. Taylor; Deputy State Engineer and Surveyor, John A. Cooper. Canal Department—Canal Commissioners, William W. Wright; one year; John D. Fay, two years; Alexander Barkley, three years. Auditor Canal Department—G. A. Dayton; Deputy ,William McGourkey. Public Instruction—Superintendent, Abram B. Weaver; Deputy, Edward Danforth. Bank Department—Superintendent, Daniel C.Howell; Deputy, Daniel Shaw. Insurance Department-- Superintendent,______________-; Deputy, George B. Church. Inspector of State Prisons—Solomon Scheu, Buffalo; Thomas Kirkpatrick, Auburn; Fordyce L.Laflin, Saugerties. Regents of the University—Ex-Officio—Governor, Lieutenant-Governor, Secretary of State, and Supt. Of Public Instruction. By Appointment—Oswald Ottendorfer, New York; John L. Lewis, Penn Yan; Horatio G.Warner, Rochester; Prosper M. Wetmore, New York; John V. L. Pruyn, Albany; Francis Kernan, Utica; Robert G. Rankin, Newburgh; Erastus C. Benedict, New York; George W. Clinton, Buffalo; John A. Griswold,Troy; Lorenzo Burrows, Albion; Robert S.Hale, Elizabethtown; Elias W. Leavenworth, Syracuse; J. Carson Brevoort, Brooklyn; George R. Perkins, Utica; Alexander S.Johnson, Utica; George W.Curtis, North Shore, L.I. ; William H. Goodwin, Clifton Springs. Officers of the Board—Chancellor, John V. L. Pruyn; Secretary, Samuel B. Woolworth. State Library—Librarian Law Library, Stephen B. Griswold; Librarian General Library, Henry A. Holmes; Librarian, Norman A. Curtis; Curator of State Cabinet of Natural History, James Hall. The Legislative powers of the State are vested in the State Legislature, which consists of two houses,-- Senate and Assembly. The Senate consists of 32 members. The State is divided into 32 Senatorial Districts, each choosing one Senator. The Senators receive a compensation of $3 per day during the session, but not for more than 100 days. The Assembly consists of 128 members. They each receive the same compensation as State Senators. Commissioners—Thomas S. Spaulding, John D. Williams, A. B. Chamberlain, Henry A. Best, Jacob L. McDowell, John R. Jones, O. H. Dounce, V. B. Reed, W. C. Wey. Chief Engineer—Ambrose Wise; 1st Assistant Engineer, George Hisom, 2d Assistant Engineer, Charles L. Hart. Board of Trustees—President, O. N. Smith; Vice-President, Griff D. Palmer, Secretary, Henry C. Morse, jr., Treasurer, Frederick A. Frazier; Elmira Hose Company, No. 1, O. N. Smith and Charles Hazard; Neptune Hose Company, No. 2, Miles Trout and John E. Nicks; Independent Hose Co., No.3, R. H. Walker and J. Riedinger; “Ours” Hose Co. No. 4, Henry C.Morse,jr., and Albert M. Fitch; Goodeil Hose Co., No.5, George H. Richardt, and Wm.M. Ware; Eldridge Hose Co. No.6,George Hisom and David M. Budd; Protection Hook and Ladder Co., No.1, John Wormley and Griff D.Palmer; Supt. Hose Tower, John Love. ELMIRA HOSE CO., No.1—Foreman ,Joseph Campbell; 1st Assistant, Charles Smith; 2d Assistant, Wm. Lindeman; Secretary, Charles Hazzard. NEPTUNE HOSE CO., No. 2—Foreman, Henry Simpson; 1st Assistant, Wm. Bordel;, 2d Assistant, Harry Murphy; Secretary, Wm. Simpson. INDEPENDENT HOSE CO.,No.3—President, Chas. E. Reed; Vice-President, L. D. Cauldwell; Foreman, Robert H. Walker; 1st Assistant, James H. Callahan; 2d Assistant, A. G. Loggie; Secretary, Wm. P. Hunt. “OURS” HOSE CO., No. 4—Foreman, Geo. M. Robinson; 1st Assistant, Benjamin Andrews; 2d Assistant, H. C. Hamilton; Secretary, C. W. Drake. GOODELL HOSE CO., No. 5—Foreman, Wm. M. Ware; 1st Assistant, William Ware, 2d Assistant, Jesse Lyon; Secretary, Charles Vail. ELDRIDGE HOSE CO., No.6—Foreman, Talcot Gould, 1st Assistant, LeRoy A. Baker, 2d Assistant, James Donovan; Secretary, T. W. Gould. PROTECTION HOOK AND LADDER CO., No.1—President, M. S. Decker; Foreman, C. A. Landy; 1st Assistant, D. N. Swan; 2d Assistant, Wm. H. Beardsley; Secretary, Frank Fisher. James R. Monks, A.M. Miss H. E. Munson, N. G.
The Academy building is located on a lot bounded south by Clinton street, and extending from Lake to William street three hundred and twenty-one feet, and north one hundred and ninety feet on William, and two hundred and sixty feet on Lake street, containing about an acre and a half. This lot, (with exception of a small parcel since purchased) was purchased from several owners by the corporation of the “Elmira Academy”, in 1859, and in 1860 the said corporation conveyed it to the Board of Education for an Academy site. The building is a substantial brick structure two stories high, with a basement mostly above ground. The building will comfortably accommodate 150 pupils. It was completed in 1862 at a cost of $12,000. Bounded as follows: Beginning on the north bank of the Chemung River, at the bridge of the Erie Railway, thence north on the center of said railway to Clinton street; thence east on the center of Clinton to Conongue street; thence north on the center of Conongue Street to the Junction Canal; thence east on the south bank of said Canal to Oak; thence north on Oak Street to Washington Avenue; thence east on the center of Washington Avenue to Sullivan street, and on a line with said center of Washington Avenue to the east line of the Union School District, which is the east line of the old farm of William Maxwell; thence south on the east line of the original farms of W. Maxwell, Badger, J. W. Wisner, A. Konkle and S. Tuthill, to the Chemung River; thence west on the north bank of said river to the place of beginning. The school building is located on the corner of Sullivan and Second streets, on a beautiful lot, with shrubbery and grass plots in front, and two large yards for play grounds in the rear, the whole lot containing about four acres. The building is a substantial brick structure 119 feet long by 80 wide, two stories in height, costing with the furniture, $25,000. It was first brought into use in the fall of 1868. Bounded as follows: Beginning on the north bank of the Chemung River, at the bridge of the Erie Railway; thence north on the west side of said Railway track to Clinton street; thence west on the center of Clinton street to Hoffman street; thence south on the center of Hoffman street to Water street and continuing in the direction of the center of Hoffman street to the Chemung River; thence east on the north bank of said river to the place of beginning. The School building is located on a beautiful, dry and airy lot, containing 3 ½ acres, on the corner of Davis and Second streets. The building is a brick structure two stories in height, 119 feet long by 80 wide. Its internal arrangements, size of rooms, grade of pupils, and number of seats are the same as in No. 1. Bounded as follows: Beginning at the Chemung River on the line between the farm of George Sly and the old Joseph Miller farm; thence westerly on said line to the west line of said George Sly’s farm; thence north along the west line of the said George Sly’s farm and the farm of Samuel Tuthill; thence in a westerly direction, to include the Platt Bennet farm and the farm of A. C. Kenyon on the plank rod, and continuing in a westerly direction to include the upper farm on John Sly; and thence northward to the Chemung river; thence eastwardly on the south bank of the said river to the place of beginning. The school building is an elegant substantial brick structure two stories high, with slate roof, 113 feet long by 70 feet wide and is located on a beautiful, elevated dry lot of ground containing 3 ¾ acres of ground. The internal arrangements are the same as No’s 1 and 2. The house was first occupied January 1871. The entire cost of the building, grounds, furniture, &c., was $37,000. Will seat 670 pupils. Bounded as follows: Beginning t the center of Clinton street, on the east side of Erie Railway track; thence east on the center of Clinton street to Conongue street; thence north on the center of Conongue street to the Junction canal; thence north on Oak street to Washington avenue; thence east on the center of Washington avenue to Sullivan street, and still in the direction of Washington avenue to the east bounds of the Union School Disrtict, which is the east line of the original farm of W. Maxwell. The school buildings are located on a lot containing 1 ¾ acres, situate on the west side of Lake street, near the junction canal. They consist of a brick building two stories high, 50 by 60 feet in length, with projection 12 by 30 feet on each side for halls. And a frame, one-story in height, 30 by 46 feet in length. The frame house consists of one school room and suitable cloak rooms. The brick building has 4 school rooms. Bounded as follows: Beginning on the west side of the Erie Railway track on the center of Clinton street; and thence west on the center of Clinton to Hoffman street; thence north on the center of Hoffman street to the south line of A. Bridgman’s farm; thence east on said Bridgman’s south line to the center of Grove street; thence north of the center of North street; thence east on the center of North street to College avenue; thence north on College avenue to the north bounds of the city of Elmira; thence east on said city bounds to the track of the Erie Railway; thence south on the center of said Erie Railway track to the place of beginning on Clinton street. The school building is located on the south side of Fifth street between Columbia and Davis streets, on a lot containing three-quarters of an acre. It is a frame building with three school rooms., it is entirely inadequate to the wants of the district. Both building and grounds are two circumscribed for that growing portion of the Union School District. The Board has been compelled to rent an additional building and fit it up for a school room to accommodate those now knocking for admission. A new school site on Washington avenue has been purchased, and a building is now being erected thereon which will accommodate 800 pupils and will also be the handsomest school building in the city. Elmira Female College—Main cor Washington av. Rev. A. W. Cowles, D. D., President. First National Bank—74 Water street. Capital, $1000,000; David Decker, President; John Arnot Jr., Vice President; M. H. Arnot, Cashier; Daniel Decker, S. T. Arnot, John Arnot, John Arnot Jr., and M. H. Arnot, Directors. Second National Bank—Lake street corner Carroll. 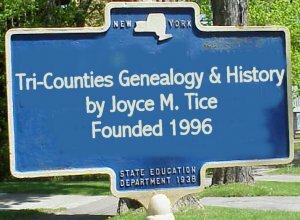 Incorporated 1864; capital, $200,000; surplus,$175.000; President,D. R.Pratt; Cashier, William F.Corey; Assistant Cashier, John E. Stowell; Directors, Daniel Pratt, C. Pratt, Daniel R. Pratt, George E. Pratt, William Dundas. Chemung Canal Bank—74 Water street (State Bank) Capital, $100,000; President, John Arnot;Vice President, S. T. Arnot; Cashier, John Arnot Jr.,; Assistant Cashier, M. H. Arnot; Directors, John Arnot, John Arnot Jr., S. T. Arnot, and H. M. Arnot. Southern Tier Savings Bank—Officers: President, David Decker; Vice President, R. H. Ransom, Rufus King; Secretary, Joseph Davis; Treasurer, James S. Thurston; Book-keeper, H. V. Ransom; Trustees: Solomon L.Gillett, Reuben H. Ransom, Jackson Richardson, James S.Thurston, John J. Curtis, David Decker, Harden D. V. Pratt, Rufus King, Joseph Davis, Francis Stowell, Henry V. Colt, De Bruce Goodell, Stephen McDonald. Bank of Chemung—Baldwin corner Carroll. Incorporated 1853. Capital, $100,000; President, Tracy Beadle; Cashier, H. W. Beadle. 110th Regiment N. G. S. N. Y.—Colonel, W. A. Gregg; Lieutenant, G. L. Smith; Major, Luther Cauldwell; Adjutant, H. H. Rockwell; Q’rmaster, E. W. Howell; Surg.,J. M. Flood. Company A—Captain, John Laidlaw; First Lieutenant, George H. Ryan; Second Lieutenant, Frank Riley. Company C—Captain; John Shay, First Lieutenant, J. B. Costello; Second Lieutenant, Patrick Murphy. La France’s City Cornet Band—135 Water, A. W. La France, Leader. Up Degraff’s 110th Regimental Band—28 Lake, J. B. Up Degraff, Leader. Congregational Church—Main corner of Church streets. Rev. Thomas K. Beecher, Pastor. First Baptist Church—Constituted May 15, 1829; Constituent Members, 38; Pastors, P. H. Gillette, H. C. Vogel, Demas Robinson, Z. Grinnell, E. W. Dickinson, J. G. Binney, C. N. Chandler, R. J. Wilson, E. Andrews, M. C. Manning, T. O. Lincoln, J. J. Keyes; total number of members since the church was organized, 1,200; present number, 350. Central Baptist Church—Church corner Conongue. Rev. E. F. Crane, Pastor. First Presbyterian Church—Church corner of Baldwin street. Rev. William E. Knox, Pastor. Second Presbyterian Church—Lake corner Church streets. Rev. N. M. Sherwood, Pastor. Free Will Baptist Church—Lake corner Standish. It was opened for service 30th July, 1869, and will seat 208; it cost about $1,500. Rev. Schuyler Aldrich, Pastor. German Episcopal Chapel—Main street, between Water and Gray streets. Rev. Frederick Esch, Pastor. Grace Church (Episcopal)—Main above Water; erected 1865. Rev. F. D. Hoskins, Pastor. Number of communicants, 140; building will seat 350; number of scholars, 170. Hedding Methodist Episcopal Church—212 Church street. Rev. John Alabaster, Pastor; Charles H. Palmer, Sunday School Superintendent. Erected 1855; cost, $30,000; will seat 700; number of members, 400; number of Sunday school scholars, 400. Jewish Synagogue—No. 10 High Street; built in 1862; at that time the congregation numbered 4, and in the same year was increased to 10; the congregation now numbers 24 members. It is a frame building 50 by 30, and will seat 300. The present Rabbi is named J. Stahl. First Methodist Episcopal Church—Baldwin between Church and East Second streets. Charles Z.Case, Pastor. South Main St. Methodist Episcopal Church—South Main corner Pennsylvania Avenue. Rev. J. G. Gulick, Pastor. St. Mary’s Roman Catholic Church—Franklin corner Fulton. Rev. James McManus, Pastor. St. Patrick’s Roman Catholic Church—Third corner Main. Rev. J. J. Bloomer, Pastor. St. John’s German Catholic Church—Dickinson street, between Fifth street and Junction Canal. St Peter’s and St. Paul’s Roman Catholic Church—61 Market street. Rev.J. J. Bloomer and Rev. I. N. B. Wells, Priests. Trinity Church (Episcopal) .Main corner Church streets. Rev. George H. McKnight, Pastor. Union Methodist Protestant Church (African)—Situated on the northwest corner Dickinson and Fourth streets. Rev. G. V. Peterson, Pastor. Young Men’s Christian Associations Chapel—Seventh street. Rev. F G. Surbridge, Pastor. Zion Methodist Episcopal Church (African)—Situated on the southwest corner of Dickinson and Fourth streets. Rev. Abraham Cole, Pastor. St. Omer’s Commandery, No.19, Knights Templar—Em. Sir, J. D. Williams; Com.,Sutherland DeWitt; Gen’o, Jon S. Bartlett; Capt, Gen’l, F. E. Cleveland; P., J. M. Shoemaker; S. W., J. E. McWilliams; J. W., John Arnot jr.,; Treas., G. D. Parsons, Rec. Union Lodge, No.95—W. : S. DeWitt,Master; D. S. Door, S.W. ; A. Derby, J. W.; G. D. Parsons, Treasurer; E. E. Merrill, Secretary; Robert Monroe, S. D.; Abbott Barber, J. D; E. S. Jenkins, S. M. C.; R. Williams, J. M. C.; Rev. E.A.Chubbuck, Chaplain; W. H. Perry, Organist; A. Welch, Tiler. Ivy Lodge, No. 397--- W: C.N. Shipman, Master; C. Robbins, S. W.; J. E. McWilliams, J. W.; J. Arnot jr, Treasurer; H. B. Berry, Secretary; E. O. Beers, S. D.; S. D. Williams, J. D.,; N. D. Doxey, S. M. C.; C. H. Richards, J. M. C.; Rev. C. Greatsinger, Chaplain; E.P. Sprague, Organist; W. H. Browne, Tiler. Elmira Chapter, No. 42—M. : E.: Maurice Levy, H. P.; E.: F. D. Ramsdell, K.; E.: Joseph Burbage, S.; John Arnot jr., Treasurer; J. E. McWilliams, Secretary; H. B. Berry, C of H.; S. DeWitt, P. S.; J. S. Bartlett, R.A.C. ; Homer Brooks, M. 3rd V.; S. B. Sergeant, M. 2d V.; Uriah S. Lowe, M.1st V.; G. H. Cotton, Tiler. Southern Tier Council, No.16--- T.: I.: F. D. Ramsdell, Master; Ill.: F. E. Cleveland, D. M.; Ill.: M. Levy, P.C.W. ; G. D. Parsons, Treasurer; W. H. Browne, Recorder; D. S. Dore, C. of G.; A. Derby, C. of C.; Alex Murry, Jr., Steward; R.Williams, Sentinel. Southern Tier Masonic Relief Association--- Incorporated under the laws of the State of New York; regular meeting of directors, third Monday in each month. Officers: C. M. Shipman, President; Maurice Levy, Vice President; G. D. Parsons, Treasurer; F. D. Ramsdell, Secretary. W. L. Gibson, D. D. G. P.
O. H. P. Kinney, D. D. G. M.
Newton Lodge, No.89 I. O. of O. F.—A. E. Macnier, N. G.; E. C. Terry, V. G.; E. O. Beers, Secretary; James McCann, Treasurer. Meets at Holden’s Hall, Water cor Baldwin streets, Monday evenings. Fort Hill Encampment, No. 18---C. G. Fairman, C> P.; Wm. Emblen, H. P.; Wm. Olivey, S. W.; E. O Beers, Scribe; James McCann, Treasurer; J. H. Giles, J. W. Meets at Holden’s Hall, Water cor Baldwin streets, 1st and 3rd Friday evenings of each month. Odd Fellows’ Relief Association—J. M. Tillman, President; Josiah Bartholomew, V.P. ; W. L. Gibson, Secretary; James McCann, Treasurer; Directors: J. M. Tillman, J. Bartholomew, W. L. Gibson, James McCann, Charles Hazzard, G. W. Palmer, W. P. DeWitt, Wm. Olivey. Father Matthew Total Abstinence Benevolent Society—Meets in the St. Peter’s and Paul’s Church School House on every second Sunday. Officers: Wm. Collins, President; James Mungovan, Vice-President; Michael Gurnett, Financial Secretary; William Collins, Recording Secretary; Timothy Murphy, Treasurer. Catholic Young Mens’ literary Association—Meet Cowen’s Block every Wednesday evening Rev. J. J. Bloomer, President; William Sullivan, Vice-President; Thomas Murray, Treasurer; P. J. Lee, R.S. ; John Birmingham, F.S. Elmira Division, No. 41,Brotherhood of Locomotive Engineers—Officers: Jud. Putney, Chief; Wm. Homer, F.E. ; John G. Regan, S. E.; Thomas Reardan, F. A. E.; E.D. Bixby, S. A. E.; Daniel Porter, T. A. E.; S. L. Sims, Guide; W. H. Browne, Chaplain. Division rooms, Bundy’s Block, cor lake and Carroll streets. Meets 1st and 3rd Sunday of each month. A. F. O. K. S. B., Aaron Lodge, No. 29--- Meets AT the Odd Fellows’ Hall every Sunday evening. Officers: M. Grant, Av. ; L.Bauman, Passi. ; J.L. Pollack, Ach. ; S. Sittenfield, Alitz. ; Sol. Unger, Sopher. ; S. Johnson, Asst. Sopher. ; W. Bush, Gisher; B. Erlich, Cohen. ; J. Selner, Sgan. ; J. Samuel, S.; S. Wittkonsky, S. H.
Elmira Mannerchor-- Meets every Monday and Thursday evening at St. Crispin’s Hall. W. F. Detrich, President; Fred. Hagen, Leader. Elmira Saengerbund—Meets every Monday and Thursday evenings in the German School House. Henry Houpt, President; Frank Karsten, Secretary; Earnest Shidlen, Treasurer; Frederick Hagen, Leader. Elmira Turnverein—Meets every Thursday and Friday evenings in Turner’s Hall, Carroll street. F. Maas, Turnwart; A.F. Stabler, Turnrath; F. Vogenroth, 1st Speaker; Philip Seiss, 2d Speaker; Louis Shidlen, Secretary; Charles Hoope, Treasurer. Knights of Pythias, Elmira Lodge, No.81—Meets at the Odd Fellows’ Hall, cor Water and Baldwin, every Thursday evening. Wm. Ware, W.C.; J.L. Pollack, V.C. ; S.Johnson, V.P. ; and D.D.;Geo.S. Smith, Rec. Sec’y; R. Ferguson, Fin. Sec’y; J.F. Atwell, Banker; Frank Rathbun, Guide; H. Sutton, I. S.; E. D. Bixby, O. S.
Chemung County Trades’ Assembly—Officers: President, J. W. Donavan; Vice President, William Olivey; Recording and Corresponding Secretary, William Dowling; Financial Secretary, Mrs. Julia Turney; Treasurer,______________; Sergeant-at-Arms, F. H. Gardiner; Trustees, Mrs. George Swift, J. A. Wilkey, and Scott Davenport. Meetings held on the second Tuesday evening of each month, at Crispin Hall, Carroll cor Lake streets. Cigar Makers’ Union, No.10—Meets on the last Saturday in the moth at St. Crispin Hall, Carroll cor Lake. President, Moss Hart; Vice President, Robert Hogg; Corresponding Secretary, Daniel Cahaley; Financial Secretary, John McCafery; Treasurer, Jere Connelly. Daughters of St. Crispin, Elmira Lodge, No.18—Meets on the first and third Tuesdays in each month, in the St. Crispin Hall, Carroll corner of Lake Street. Elmira Academy of Medicine—Organized 29th of June, 1852; regular meetings once a month; officers elected every year; number of members, 25. Officers of the present year; President, Dr. P.H. Flood; Vice President, Dr. I. B. Graves; Secretary, Dr. L. Velder; Treasurer, I. F. Hart; Censors, Drs. Stanchfield, Chubbuck, Purdy; Members, Drs. F.B. Abbot, L.F. Chase, H.S.Chubbuck, P.H. Flood, John M. Flood, A.H. Flood, E. L. Hart, I. F. Hart, H. Meisel, H. H. Purdy, I. K. Stanchfield, T. H. Squire, L.Velder, William C. Wey, E. R. Wheeler. Elmira Harness Makers’ Union—Meets on the last Saturday of each month. Officers: President, Andrew DeGraw; Vice President, William C. Tompkins; Secretary, J. W. Trescott; Treasurer, Andrew DeGraw. Elmira Lodge, No. 90, D. O. H.—Meets every Wednesday evening at 131 Water street. Officers: John Miller, O. B.; Gustave Gilsdorf, U. B.; Nicholas Diester, Corresponding Secretary; Jacob Neier, Recording Secretary; Philip Arnold , Treasurer. Elmira Mechanics’ Society—Instituted Jan. 15th, 1834, 8 Opera Block. J.Bartholomew, Presidnet; A. Stowell, V.P. ; R.R>R. Dumars, Sec. ; J. S. French,Treas. I. O. of G. T. Foy Lodge, 149--- Meets every Tueadsy evening in Good Templar Hall, Opera Block. C. N. Shipman, W. C. T.; F. G. Churchill, W. S.
Elmira Typographical Union, No. 19—Meets on the first Saturday in the month, in the St. Crispin Hall, Carroll corner Lake streets. Officers: James C. Huston, President; Seymour Copeland, Vice President; C. C. Thatcher, Recording Secretary; M. J. Sullivan, Corresponding Secretary; S. S. Stiles, Financial Secretary; Charles Hazzard, Treasurer; J. R. Watts, Sergeant-at-Arms; Deliberative Committee, J. J. Cook, David Mapledorum, Jacob E. Sechler. German Library Association—Jacob Weyer, President; George H. Richardt, Secretary; L. Rosenbaum, Treasurer; John Brand, L. Holzheim, Albert Wageman, Ernest Shidlen, Trustees. K. O. S. C. Elmira Lodge, No.21--- Meets on the second and fourth Thursday in each month, at St. Crispin Hall, Carroll corner Lake street. Officers: S. K. , J. B. Upham; K., John Gilmore; E. S., L. J. Jackson; R. S., Thomas Hogan. Machinists’ and Blacksmiths’ Union of North America, No. 16, Elmira, N.Y.-- Officers: James Donivan, President; Joshua Richards, Vice President; G. A. Jarow, Financial Secretary; James Tillison, Corresponding Secretary; Edward S. Jenkins, Treasurer. Orphans’ Home—Fulton corner Franklin. Incorporated 1864, as The Ladies’ Relief Association; in 1867, name changed to Southern Tier Orphans’ Home. Rev. A. G. Burlingame , Superintendent; Mrs. David Decker, President; Mrs. Peter A. LA France, Vice President; Newton P. Fassett, Treasurer; Mrs. Edgar St. John and Mrs. A, G. Burlingame, Secretaries. Post Baldwin, No. 6, G. A. R.—Rooms in Beach’s block, Lake street. Regular encampments Monday evening. Officers: Com. ; Seymour Dexter,S.V. C.; A. G. Barnhart, J. V. C.; J. V. Shappe, Adjt. ; Theo. G. Smith, Q. M.; John G. Copely, Q.M. S.; C. R. Wallace, O. D.; G. W. Thornly, O. G.; N. D. Simons, Rev. J. J. Keyes, Chaplain. St. Peter’s and Paul’s Benevolent Society--- Officers: John Mathews, President; Daniel McCarty, Vice President; Michael Colligan, Recording Secretary; Michael Sullivan, Corresponding Secretary; James Gill, Treasurer. Tailors’ Protective Trade Society—Meets on the first Monday in the month at 113 Water street. Officers: President, Henry Haupt; Vice Prest., H. F. Smith; Secy., Henry Parsons; Treas., John Olsen. Young Mens’ Chrstian Association—The Association was established in 1858, with the following officers and additional members as its first Board of Managers: H. M. Partridge, President; S. B. Fairman, Vice President; A. R. Wright, Corresponding Secretary; S. Van Campen, Recording Secretary; S. Ayres, Treasurer; Additional Members, F. Collingwood, D. Thomson Dunn, I. F. Hart, J. R. Ward. Its leading objects is the moral and intellectual well-being of young men. It sustains prayer meetings, out door meetings, and Mission Sunday School; and has a beautiful chapel in the Second Ward at a cost of $2,500, where Sunday services are held and a large and flourishing Sunday-school is sustained. The Association provides for a city missionary to attend to its benevolent and religious work, expending about $2,000 annually for the poor. He also has charge of the Night School. He looks after employment for the poor and the stranger. The circulating library of the Association numbers three thousand volumes, and the reference library about five hundred more. The library table is supplied with all the leading magazines and quarterlies. The reading room contains on file all the prominent papers published. The use of the library costs, to members, one dollar; to all others two dollars per year, payable quarterly, semi-annually, or annually. The reading room and reference library are free. The Association sustains an annual course of lectures and monthly literary meetings and reunions. Quarterly sermons are also delivered by eminent clergymen from abroad. The present Board of Managers are: J. B. Dunning, President; E. P. Bennent, Vice President; I. F. Hart, Corresponding Secretary; M. Ayrault, Recording Secretary; E. S. Palmer, Treasurer; I. A. Hobbie, Chairman of Church Committee; Additional Members, W. L. Curtis, R. Morse, Jr., J. F. Laidlaw, J. F. Shearer. The rooms of the Association are situated on the cor of Lake and Carroll sts. Elmira Co-operative Boot and Shoe Company—Second cor the Canal; Incorporated, 1870; capital, $25,000; Levi Averill, President and Treasurer; Robert Covill, Secretary; Directors, Levi Averill, H. M.Partridge, Robert Covill, Frank Atkinson, R. J. Flemming, John Laidlaw, Thomas Spence. Elmira Gaslight Company—Office Chemung Canal Bank Building; incorporated 1852: capital, $50,000; James L. Woods, President; S.T. Arnot, Sec’y, Treas. And Supt. ; James L. Woods, John Arnot, S.T.Arnot, John Arnot jr., W.H> Hart, Directors. Elmira Water Works—Office 153 Water , organized April 1869; President, Alexander S.Diven; Vice President and Treasurer, G. M. Diven; Secretary, James A. Touner; Superintendent, John H. Leavitt; capital, $50,000. Function Canal Company—Office, Chemung Canal Bank Building; incorporated 1852; capital, $400,000. President, John Arnot, Secretary and Treasurer, S.T. Arnot; Directors, John Arnot, John Arnot jr., C. F. Wells, Lymen Covell, R. Watrous. McIntyre Coal Company—Organized January 1870; President, C. J.Langdon; Secretary, W. D. Kelly, 6 Baldwin. Elmira and Horsehead Railway—President, A. S. Diven; Superintendent, E. J. Cowell; Office Lake n junction William. Elmira Daily and Weekly Advertiser—Published by the Elmira Advertiser Association. Charles G. Fairman, President; S. C. Taber, Sec’y; F. A. Devoe, Treas. And Sup’t. lake corner Market. Daily, $9;Weekly $2. 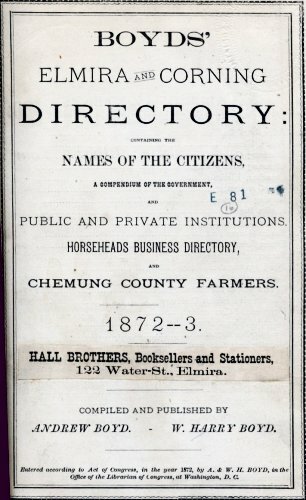 Elmira Daily and Weekly Gazette—daily published every afternoon at 3 o’clock by the Gazette Company No. 4 Opera Block, Carroll street; is served to city subscribers for 15 cents per week or $8 per annum. Weekly—Published every Thursday. Terms $2.00 per year.